Einojuhani Rautavaara (9.10.1928-27.7.2016) is after Sibelius one of the best known and most frequently performed Finnish composers internationally. Rautavaara was by nature a romantic, even a mystic, as was apparent from the titles of his works: for example Angels and Visitations for orchestra or his double-bass concerto Angel of Dusk. Despite Rautavaara's label of "mysticism" his works cannot be categorized in stylistic terms. At the age of seventeen Rautavaara began studying the piano and later went on to study musicology at Helsinki University and composition at the Sibelius Academy. From 1951-53 he was a pupil of Aarre Merikanto receiving his diploma in composition in 1957. In 1955 the Koussewitzky Foundation awarded Jean Sibelius a scholarship in honour of his 90th birthday to enable a young Finnish composer of his choice to study in the United States. Sibelius selected Rautavaara who spent two years studying with Vincent Persichetti at the Juilliard School of Music in New York and also took part in the summer courses at Tanglewood given by Roger Sessions and Aaron Copland. In 1957 Rautavaara continued his studies with Wladimir Vogel in Ascona, Switzerland and a year later with Rudolf Petzold in Cologne. 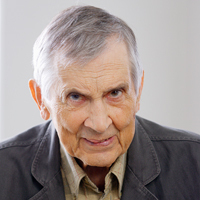 Rautavaara has taught and lectured at the Sibelius Academy as the professor of composition. Since 1988 he made his living as a composer in Helsinki. Rautavaara's earliest works revealed close ties to tradition but also his desire to renew it. They were followed by an extreme constructivist and avant-garde phase (as in the serially organized fourth symphony "Arabescata", 1962) after which Rautavaara turned to hyper-romanticism and finally mysticism. Since the early 1980s, Rautavaara adopted a sort of post-modern musical language in which modern and traditional elements of varying degrees of constructivism or freedom were combined with one another. Rautavaara composed eight symphonies, the most frequently performed of them being the Angel of Light, his seventh symphony. Symphony No. 8, The Journey was premiered in April 2000 by The Philadelphia Orchestra under Wolfgang Sawallisch. Other important groups of works include concertos for different solo instruments, among them the three piano concertos, two cello concertos, the popular Violin Concerto (1977), the Harp Concerto (2000) and the Clarinet Concerto (2001-02). Rautavaara has also written a large body of chamber music as well as choral and vocal works including All-Night Vigil for a cappella chorus and Missa a cappella. One of Rautavaara's most popular works is Cantus arcticus, concerto for birds and orchestra, in which the straightforward orchestral part is juxtaposed with the sounds of birds recorded by the composer himself. Rautavaara's final orchestral works, published by Boosey & Hawkes, include Manhattan Trilogy (2004), Book of Visions (2005), Before the Icons (2005), and A Tapestry of Life (2007). Apart form his symphonies (ODE 1145-2Q) and concertos (ODE 1156-2Q), the central pillars of Rautavaara's extensive oeuvre are his operas. With Vincent (1985-87) and The House of the Sun (1990) Rautavaara scored a notable international success. Aleksis Kivi (1995-96) was premiered at the Savonlinna Opera Festival in 1997 and it has been performed in Cosenza, Italy and Minneapolis, U.S.A since then. His final stage work, Rasputin (2001-2003) is an opera about the life of mystic and healer Grigory Rasputin. Rautavaara's first opera, Kaivos (1963), was staged for the first time in Budapest, Hungary, in 2016, soon after the composer's death. A recording of the opera released by Ondine (ODE 1174-2) earned a Grammy nomination in 2012. Sonata No. 1, Op. 50 "Christus und die Fischer"
Sonata No. 2, Op. 64 "The Fire Sermon"
String Quintet (1997) "Unknown Heavens"